Android (s goog) is still the smartphone platform of choice for the world’s consumers, but it may also be the ideal operating system for the world’s armies, navies and security agencies. The versatile, open and free OS already has most of the necessary pieces in place to power the most sophisticated defense and government applications. The only thing Android is missing is a heavy layer of security and ruggedized hardware to optimize it for military purposes, according to Finnish wireless engineering firm Elektrobit. Last week, National Defense magazine broke a story on Boeing’s development of a highly secure Android smartphone(s ba) for the aerospace and defense industries, but this isn’t the first time the Google mobile OS has been tapped for military use. Elektrobit has customized Android for military and public-safety purposes and is selling that reference design to defense contractors, who then use it to build highly secure smartphones tailored for the military. One such contractor is Raptor Identification Systems, which is tailoring smartphones and tablets with biometric identification capabilities for the U.S. Department of Defense and other agencies. According to Jani Lyrintzis, VP of special terminals at Elektrobit, 80 percent of the work necessary to build a military-grade smartphone is already available in the Android kernel. Elektrobit completed the software upgrades necessary by adding a highly secure middleware between the applications layer and the operating system, which prevents apps and users from compromising governments’ understandably strict security policies, Lyrintzis said. 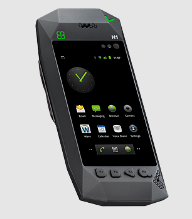 The rest is industrial design: Phones in the field need to be ruggedized to protect them from the elements, and extra hardware — such as Raptor ID’s biometric scanners — need to be added, depending on their intended use. Building on the work done for Android has enormous advantages, Lyrintzis said. The biggest among them is the streamlining and simplification of the procurement process. Typically a contractor develops a proprietary military application from scratch, building and testing new specialized hardware and software, but by utilizing existing smartphone technologies contractors essentially become Android developers working on a multipurpose platform, Lyrintzis said. In the case of Raptor ID, the DoD no longer gets a single-purpose fingerprint analyzer. It gets a device that can be used to make phone calls, send text messages, surf the Internet and access government servers, as well as scan biometrics and host any number of other military applications. It may sound crazy today, but Lyrintzis said it’s not beyond the realm of possibility that the most sophisticated of military applications — such as controlling unmanned drones — could be done right from an optimized Android tablet. Today’s technology supports it, he said; it’s just a matter of ensuring that the security is airtight, for obvious reasons. In addition, militaries wouldn’t have to reinvent the wheel every time they wanted to take advantage of consumer or enterprise applications already in the market. Rather than enlist a developer to build a specialized expense-management app, commercial app developers could develop more-secure versions of their existing apps for military smartphones. There’s probably not much software available in Google Play or other app stores that the DoD could use off the shelf, but with some security tweaks, a consumer app could be turned into a military-grade app, Lyrintzis said. It may not be long before we see military app stores popping up beside their consumer counterparts.